translation: Maria Escolástica da Conceição Nazaré, daughter of Oxum, was from the Gantois terreiro*. 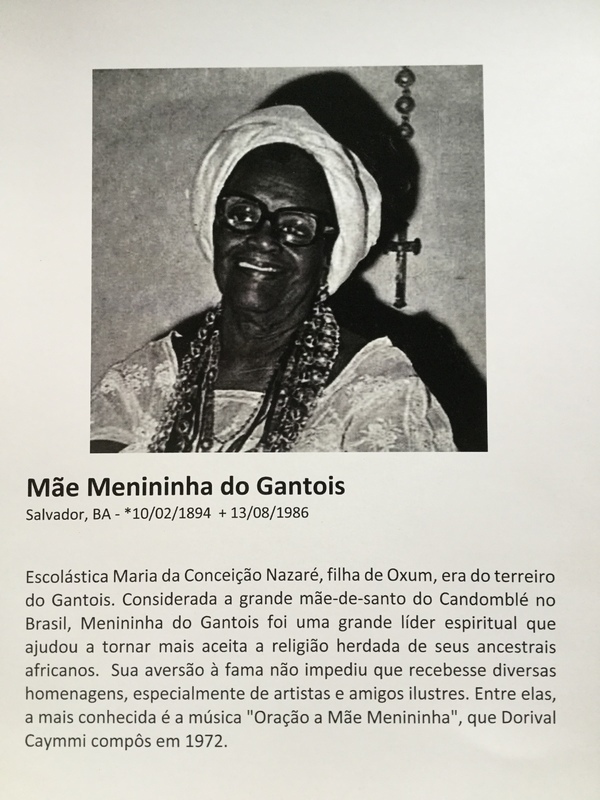 Considered the great Holy Mother of Candomblé in Brazil, Menininha of Gantois was a great spiritual leader who helped foster acceptance for the religion she inherited from her African ancestors. Her aversion to fame did not impede her from receiving many tributes, especially from artists and her illustrious friends. Among them, the most well-known is the song, “Prayer for Mother Menininha,” that Dorival Caymmi composed in 1972. *terreiro: In Candomble and other traditional African religions, the “terreiro” is the place where the group gathers to practice their rituals. A practitioner belongs to a specific “terreiro” the way a Christian belongs to a specific church, a Jew belongs to a specific synagogue, or a Muslim belongs to a specific mosque.